The brittleness scale: the environment of each ecosystem can be located along a brittleness scale, with non-brittle environments at one end and brittle at the other. Non-brittle environments are classified as those with an even distribution of humidity and rainfall throughout the year. Brittle environments have uneven distributions of humidity and rain fall throughout the year. Nature functions in wholes: Natural systems are complex and self-organizing and must be managed differently than complicated, mechanical or man-made systems. The predator-prey relationship: the grazing animals of the world’s grasslands evolved with pack-hunting predators. The impact the predators had on the herbivore behavior influenced the way the grasses and soils of the grasslands evolved. Timing, the fourth insight is the hardest for people to really grasp. Holism is the most challenging to apply to real life, but to simply grasp the concept of timing is difficult. For me. For workshop attendees. And for the academic world apparently as so many people use the terms rotational grazing and mob grazing interchangeably with Holistic Planned Grazing. They are not the same and the fundamental difference is the insight of timing that led to the development of Holistic Planned Grazing. Let’s look at each of these grazing options in turn to understand their differences. Set stocking: this is where cattle or other livestock are turned out and they are allowed to stay on the same land for a long time. Most public land grazing permits are managed this way. There is an (often huge) area that the cattle are turned out on to and they stay in this area until they are gathered up at the end of the season. There is no management of their behavior in set stocking. This is often the practice in the Western United States where there are large herds of cattle and sheep grazing on vast expanses land in brittle environments. Rotational grazing: This is a method of managing livestock so that they are moved from one pasture or area to the next. The management of rotational grazing simply considers the moves, not the timing of the moves. The growth rate of the plants are not considered nor the recovery time of plants after grazing. Often times rotations are set. The cattle or livestock will often times rotate in the same pattern through the same pastures each year. This is often practiced in non-brittle environments, like England, with small herds and small pastures. Mob grazing: This is high stock density, short duration grazing, where there are high numbers of animals bunched together to increase animal impact. They are moved frequently, as often as 3 times per day. It is more related to rotational grazing because the cattle or livestock are kept on a set rotation, typically. The recovery time of plants is not planned for in mob grazing. In the newest (yet to be released) edition of Holistic Management, Allan and Jody explain how Allan came to understand the importance of timing in using livestock to reverse desertification. This insight was gained from the work of Andre Voisin who worked in the non-brittle environment of Western Europe with a method he called rational grazing. 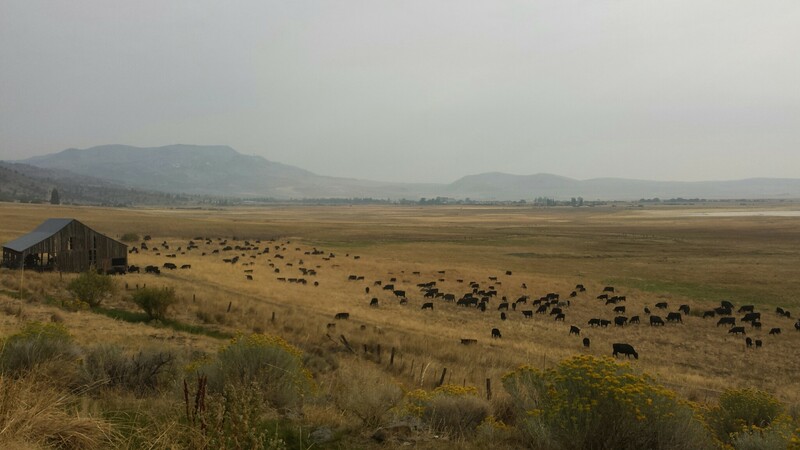 Here is a video taken from the upland areas of Springs Ranch looking down to the cattle in the field that are moving according to our holistic grazing plan for this year.